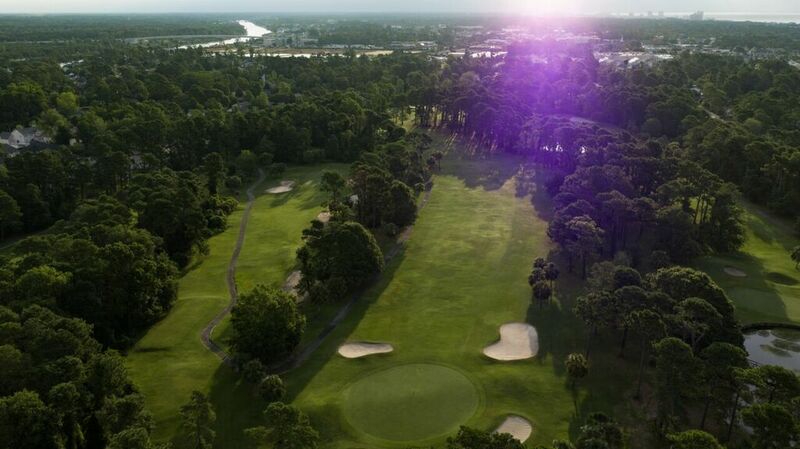 Designed for the novice golfer up to the single digit handicapper, Possum Trot is particularly suited to diverse levels of play and lives up to its rating as “Friendliest Course on the Strand”. A traditional, straightforward design with tree-lined fairways, rolling terrain, ponds, fairways, and greenside bunkers flanking large undulating greens pose a wide range of skills challenges and shot opportunities. Possum Trot Golf Club’s finishing hole, #18 (a.k.a. “Oh, No”), is a great way to finish your round. This par 5 closes within view of the clubhouse and the fountain pond. Long hitters have to work against the prevailing ocean breeze, an uphill fairway and guardian water hazard water to get on in two. Once you’ve played your last shot, visit the on site pro shop and restock on a number of essential items featuring the one-of-a-kind Possum Trot Golf Club logo — a possum sporting a bag of golf clubs – and give your friends and family a whole new take on what it means to “play Possum”.